Video Weather is a weather station that includes live video from up to three cameras connected to it. It presents meteorological information of the place where it is installed, as well as allowing the images to be viewed. In order to access the meteorological data and images you just need a web browser in a PC or mobile device. The data and video transmission is undertaken by means of internet access (with Ethernet connectivity) or a 3G mobile telephone network. 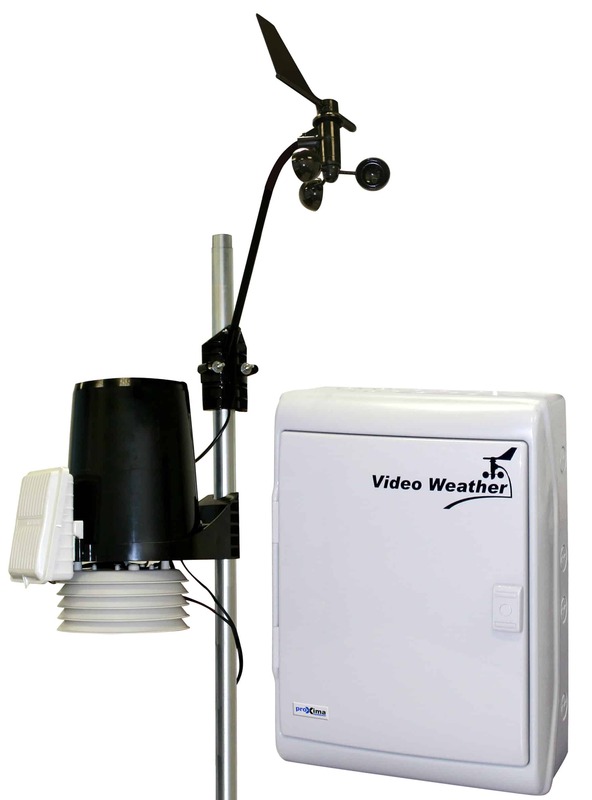 Video Weather includes a kit with professional meteorological sensors monitored by an industrial controller. The controller collects the measurements made by the station together with the images captured by the cameras, generating a web interface with the information in real time. Video Weather can provide both real time meteorological information and statistical data and offers the possibility of integrating video from up to three fixed or motorised cameras. This system can periodically send images and meteorological information to a remote server to be included in websites. Monitoring of work centres in high mountain areas. VIDEO-WEATH: standard model with Ethernet communications and a 110-230Vac power supply. VIDEO-WEATH3G: model with 3G communications and a 110-230Vac power supply. VIDEO-WEATHFV: model with 3G communications powered by a photovoltaic solar panel. Iprox Cloud: the IProx Cloud service offers the consolidated receipt, storage and consultation of meteorological data of as many Video Weather systems (or others) as necessary. Barometric pressure and barometric tendency. Accumulated daily, monthly and annual rainfall. Maximum and minimum daily, weekly, monthly and annual values of the parameters above. Electricity supply (with the exception of the solar-powered model). In the 3G model: mobile telephone coverage and a SIM card. Video Weather offers the possibility of adapting to the specific needs of each particular case. Please consult us if you need customised views, the development of a personal interface or any other requirement. We will provide you with a personalised solution. Power supply 12Vcc/220Vac - 15 W.
Airtight box for outdoor installation. P: Is it possible to integrate the meteorological information collected by Video Weather into a website? Yes. The system can be configured to send data to a remote server, via FTP. P: Can the controller be installed outdoors? Yes. We recommend that it is covered by a small canopy (50x50cm is sufficient) to protect it from the sun and the rain. P: How much data does the 3G model transmit each month? If it is only transmitting meteorological data, 1 Gbyte/month is enough. If video is also transmitted you would need to contract between 3Gbytes and 5Gbytes. P: Do the sensors work well in high mountain areas? If the installation location is in a high mountain area, we recommend that you install a heated anemometer (available on request) to avoid the accumulation of ice on the sensors. Consult our sales department.